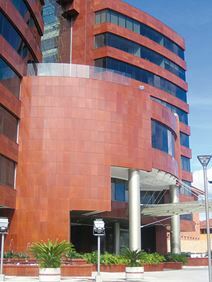 Office space available in a high-quality Costa Rica building. The building is only 15 minutes’ from the international airport by the highway. The location is the up market Escazu business district of San Jose. The area already has a range of prestigious international tenants, including Microsoft, Cemex, BASF and Citibank, and has a range of dining, shopping and entertainment facilities. Just half an hour from an international airport, and a short drive from a main highway, this high-end executive suite center provides excellent quality office space in a friendly and professional business atmosphere. A newly completed, luxury office building, with offices available in a range of sizes. This premium San Jose building features 2 meeting rooms, an auditorium, bilingual reception and state of the art communications infrastructure. The building is located near a five-star hotel and a shopping mall, and the downtown area can be reached in 10-15 minutes’ by public transport. The center is easily accessible due to the extensive transport links. This luxurious San Jose business centre features a spacious reception/lobby, meeting facilities, common areas and quality business support staff. The centre is well-located, being only 20 minutes’ to the international airport, and 800 metres from the major shopping mall, Multiplaza. The offices are fully furnished, and the centre boasts excellent communications equipment.